In an unprecedented run for a school the size of Deer Park Jr./Sr. High School, the Deer Park Marching Wildcats made its 26th straight trip to Welcome Stadium at the University of Dayton for the OMEA State Band Finals this weekend. Facing adversarious conditions throughout the event, the band still earned a II-Excellent final rating, missing the coveted I-Superior rating by just one point. "While it's always wonderful to earn the I-Superior rating, we're all extremely proud of the job the students did Sunday despite the monumental obstacles," Deer Park Bands Director Matt Suddendorf said. "It has been a tremendous season, and we thank everyone for their support and encouragement these past several months." The Marching Wildcats began their run with another successful Band Camp more than two months ago, with the ultimate goal of making it 26 straight. 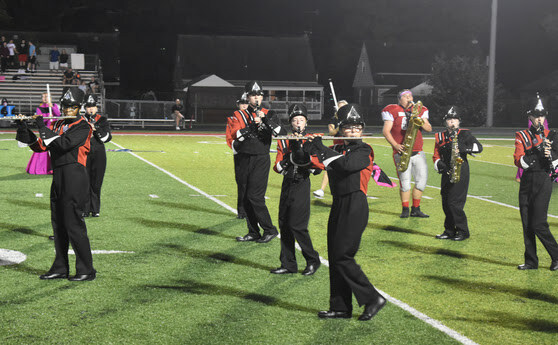 With a victory at the Tipp City Competition on the resume, the band officially qualified for the State Finals at the Kettering-Fairmont Band Invitational on Oct. 6. The State Finals wrap up another successful competition season for the squad, who will look to make it 27 in a row next fall. Congratulations to all of our students, staff and parents on another wonderful year!